What is Theodore Roosevelt most known for? Prior to becoming president, Roosevelt was famous for leading the Rough Riders in a battle at San Juan Hill in Cuba. While he was president he gained the nickname The Trust Buster for breaking up large companies called monopolies. His most famous quote is "Speak softly and carry a big stick". 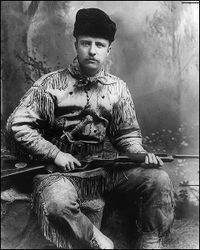 Theodore Roosevelt grew up in a wealthy family in New York. He was a sickly, asthmatic child. His father suggested that he exercise and stay active in order to improve his health. This worked and Teddy became a strong young man who liked the outdoors and staying active. Theodore went to Harvard University and then studied law at Columbia. He soon went into politics and won a seat on the New York state legislature. However, tragedy struck when his first wife and his mother passed away. Theodore was devastated and went to the American west to work on a ranch as a cowboy. Roosevelt returned to New York in 1886 and got married soon after. He began to work for the government again and held a variety of jobs over the next several years including the U.S. Civil Service Commission under President Benjamin Harrison, New York City Police Commissioner, and Assistant Secretary of the Navy. In 1898 the Spanish-American War broke out. Roosevelt gathered a bunch of volunteers and formed a volunteer cavalry regiment that became known as the "Rough Riders". Roosevelt and the Rough Riders became famous war heroes for their charge up San Juan Hill in Cuba. After the Spanish-American War, Roosevelt was elected governor of New York. He became known as a fierce fighter of corruption within the government. In 1900 he became Vice-President as running mate to President William McKinley. In September of 1901, President McKinley was assassinated and Roosevelt became president. As president, Roosevelt worked hard to improve the quality of life for the average American. He took on large corporations that had formed monopolies or trusts. These trusts enabled companies to keep wages low and prices high. Roosevelt broke up many of these trusts and earned the nickname "the trustbuster". He won the 1905 Nobel Peace Prize for his efforts in negotiating peace between Russia and Japan. He established the U.S. as the "police power" for the Western Hemisphere stating that the U.S. would protect threatened countries in North and South America. This was called his "Big Stick Diplomacy". He helped to increase the government regulation and safety standards of food and medicine with the Meat Inspection Act and the Pure Food and Drug Act. He worked on conservation by setting aside large areas of land out west for national forests and public use. He saw to it that the Panama Canal was built, creating a short cut between the Atlantic and the Pacific Ocean. Roosevelt died in 1919 when his health failed. His health was never quite the same after his youngest son, Quentin, died in World War I a year earlier. At 42 years, 10 months, 18 days old he was the youngest man to hold the office of president. 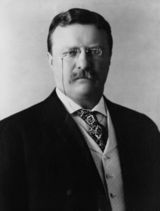 After sitting out a term, he ran for president again in 1912 for the Bull Moose Party. He made a strong showing, but did not win. He didn't like the nickname Teddy, but preferred TR or Colonel. When he traveled to visit the Panama Canal in 1906 he became the first U.S. president to leave the country while in office. He was blind in his left eye due to an injury in a boxing match. He was shot in 1912 while campaigning for president for the Bull Moose Party. He continued with his speech stating that "it takes more than that to kill a Bull Moose".